My son and I found 8 green specimens, 2 nice whites and a brown. These are all good ones. No sharp edges and good frosting. I hope the photo comes thru OK. In the photo can be seen our best find yet, at the same spot, a very nice Cobalt Blue. My son spotted it! (he said proudly). 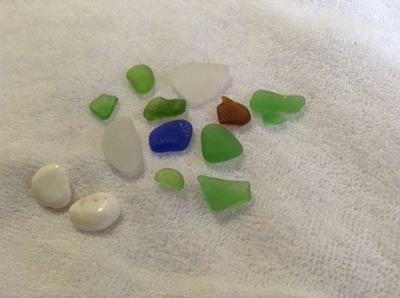 We also found two small white pieces of highly polished shell or pebbles which I thought were curious enough to keep. This beach and others like it in the town are fairly accessible. You do need to keep an eye on the waves.